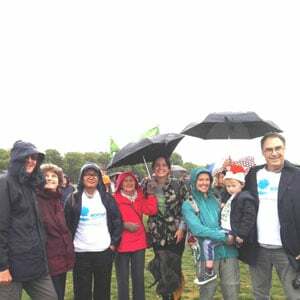 In September, A Rocha staff and supporters joined a crowd of thousands on Chris Packham’s People’s Walk for Wildlife. The march in central London celebrated the fabulous wildlife we have in this country and called for people to join together to protect and restore it. It was a typically English day, complete with drizzle, but thousands of people turned out nonetheless, cheering and playing birdsong through their phones, demonstrating that there is a real appetite in this country to see nature protected and restored. The difficult truth, however, is that the goodwill and fun of the march needs to be followed up by urgent action, in our homes and in our politics, to halt the decline of nature in these isles. On this, as in so many of the great issues of our time, the church has a key role to play. In the mid-noughties, it was the church that gave the critical momentum to the campaign to substantially reduce the debt burden on countries in the global south. Our aim then was to reduce poverty, but environmental degradation—one symptom of which is the devastating loss of so much of our wildlife—threatens to drive millions back into the poverty they have so recently escaped. This is an issue of justice. Our wonderful, fascinating, diverse wildlife cannot speak up for itself in the corridors of power. Nor can those threatened with a return to extreme poverty by the present reality of climate change. But we can. We must speak up for those who have no voice.